Pictured, left to right: Jeremy Gault – Director, Coastal Marine and Research Centre, Euan Thomson – Dobbin Scholar (University of Alberta), Prof. John Kelly – Executive Director, ICUF, Dr. Michael Murphy – President, UCC , Dr. Erin Joakim – Dobbin Scholar (University of Waterloo) and Dr. Douwe Van Sinderen, Associate Professor, UCC. Since 1997, when our first UCC scholar travelled to Memorial University in Newfoundland, over 20 of our scholars have come from or to UCC to conduct their research. 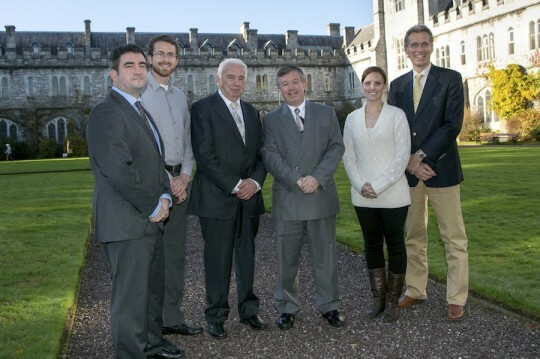 This month saw two Canadian Scholars coming to UCC, and the university’s President, Dr. Michael Murphy met with the scholars, their UCC research partners, and our Executive Director, Prof. John Kelly, to discuss their research and the scholarship programme. Welcoming the Canadian scholars, Dr. Murphy said “UCC is proud to be a part of this initiative which nurtures ever stronger ties between Ireland and Canada with each passing year. We particularly welcome the two impressive scholars in question and look forward to strongly supporting their research objectives”. Euan Thompson, a research student from the University of Alberta, is conducting his research with Dr. Douwe van Sinderen in the UCC Biosciences Institute. Euan’s research is into the “Isolation and characterization of bacteriophages to target the bacterial pests of the brewing industry”. As Euan pointed out, brewing is a staple industry in Canada and Ireland, generating 1.2% and 2.9% of their respective employment, including indirect industrial activity. The Irish brewing industry reaches back at least 1,500 years, while the Canadian brewing industry predates Confederation by over 200 years. One study pegged the annual cost of biofilms to the German brewing industry at €250,000,000. There is clearly much scope for future collaboration in this area, and we wish him the best in his research. Dr. Erin Joakim, from the University of Waterloo, has the following research proposal: “Building Adaptive Capacity to Coastal Climate Change Hazards using Bottom-Up and Grassroots Approaches: A Comparison of Vancouver, Canada and Cork, Ireland”. Erin is working with Dr. Jeremy Gault, Director of UCC’s Coastal and Marine Research Centre, Environmental Research Institute. Dobbin Scholarships are awarded by the Ireland Canada University Foundation with the support of Foreign Affairs, Trade and Development Canada / avec l’appui du gouvernement du Canada, and with the support of the Department of Foreign Affairs in the Irish Government. More information about these awards can be found here. See also article in UCC News.